A little sweet, a little spicy – this curry felt so good to the tastebuds. At first I was little skeptical about making this curry, but DH encouraged me to do it. I was really surprised at the yummy taste it got. We loved it as a side dish with chapathis. Peel, core and cut apples into cubes. Chop onion + tomatoes into tiny pieces. Heat oil in a pan and add cumin seeds + apples + onion + tomatoes and mix well. Add red chili powder + garam masala + turmeric powder + lemon juice and mix well. Pour little amount of water to cook apples. Add salt and mix well. Cover and leave the pan on medium flame for some time until most of the water gets absorbed and apples become tender. Finally stir the contents well, garnish with cilantro and serve with chapathis. Tastes so yummy when hot. 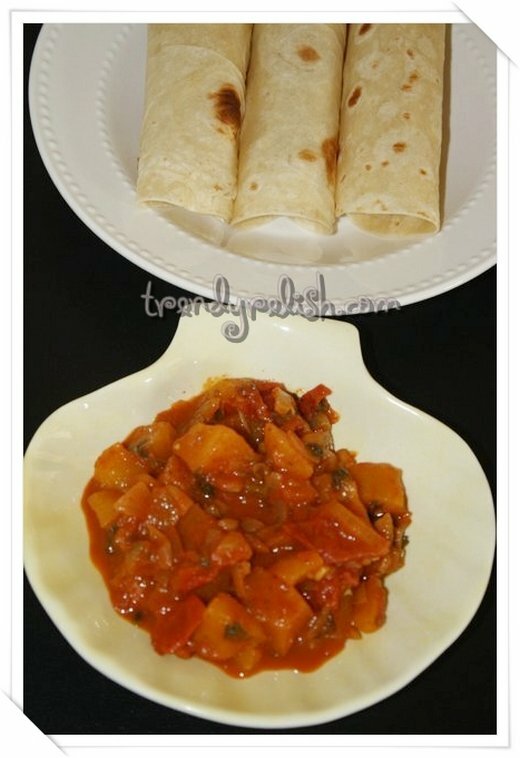 wow... very innovative recipe... looks delicious.. Very delicious and colorful apple curry. Lovely creation. sounds good, perfect for roties! what a wonderful curry using apples..sweet n spicy sounds great !! apple spicy curry sounds delicious.